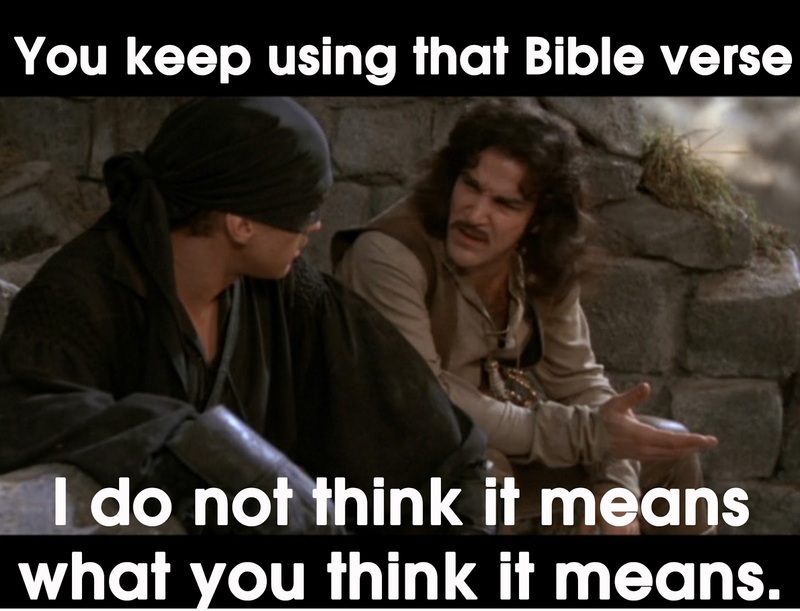 In the movie "The Princess Bride" the inimitable character Vizzini keeps using the word "inconceivable" at every chance possible. Finally, Inigo Montoya can't take it anymore, turns to Vizzini and says, "you keep using that word, I don't think it means what you think it means." As Christians, I think we might have more in common with Vizzini than we would care to admit. I sure wish I had an Inigo Montoya there to correct me when I needed it. But if the truth be told, I have someone better than Inigo Montoya. Jesus called him "the comforter" or "the advocate." We call him, "the Holy Spirit." He has many functions, and correcting us is one of them. Let me offer an example. All my life I've been convinced that Philippians 1:6 was a declaration of our continued progressive sanctification. 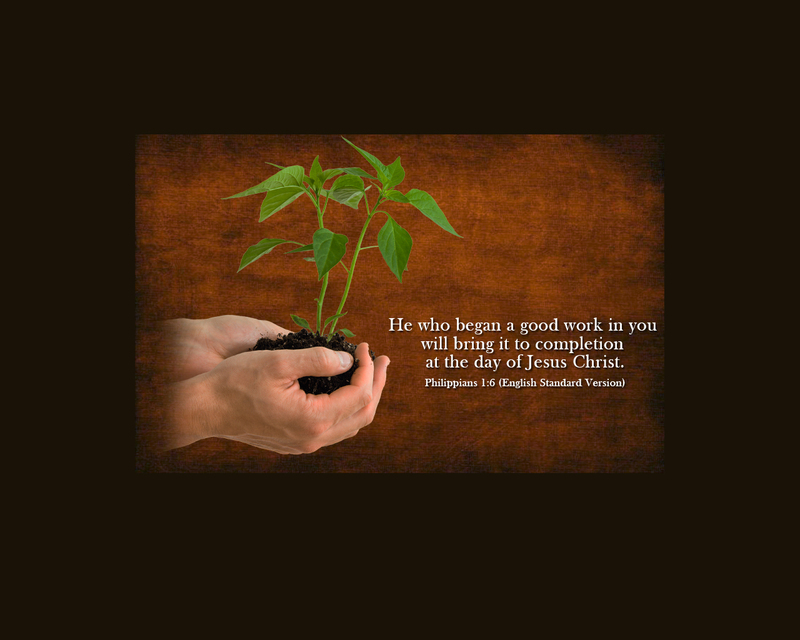 You know the verse, "And I am sure of this, that he who began a good work in you will bring it to completion at the day of Jesus Christ." That's about progressive sanctification right? Or is it not? As I was studying this passage recently, I began to have my doubts. It was like the Holy Spirit was there whispering in my ear, "you keep using that verse, I don't think it means what you think it means." Before I continue, let me put your fears to rest. I still believe in progressive sanctification. I think it's all over the pages of the New Testament. I just don't think it's on this particular page, not in this particular chapter, and not this particular verse. So if Philippians 1:6 is not about progressive sanctification, then what is it about? In verse 6, Paul references the "good work" which God began in the Philippian church. But Paul is not referencing this "good work" in a vacuum, he's already mentioned what that good work was in verse 5, the "partnership in the gospel." Paul is citing the Philippians continues to share with Paul, their money, their people, and in suffering. In fact, in chapter 4, Paul says, "Yet it was kind of you to share my trouble. 15 And you Philippians yourselves know that in the beginning of the gospel, when I left Macedonia, no church entered into partnership with me in giving and receiving, except you only." The Philippians are most likely afraid that all of their efforts have been done in vain now that Paul is sitting locked up in a Roman prison cell. Imagine investing all you have into a company only to see the government come in and shut them down. You would feel like all of your effort and investment has been done in vain. I imagine the Philippian church felt the same way. "you've partnered in the gospel with me. You've invested money in me. You've invested people to serve me. You've invested in prayers and suffering with me, and all of this partnering with me in the work of the gospel will not be short circuited simply because I'm sitting in a Roman prison cell. Instead, this partnership in the gospel 'will be brought to completion at the day of Jesus Christ' so don't worry. Be encouraged. Nothing was in vain. The work will not stop just because I'm behind bars." I think that makes verse 6 encouraging for two reasons. 1. Whatever you have done in service to God will not be lost, thwarted, short circuited, erased, or diminished. God WILL bring it to completion at the day of Christ. So whatever you've done in service to God that you feel like was done in vain, you're wrong. Partnering with God in the work of the gospel will be brought to completion at the day of Christ, even if our natural eyes see it having come to an end. Don't believe the way things appear. God is still using what you thought was done in vain. 2. We can be encouraged to continue our efforts for the sake of the advancement of the gospel with full assurance that our efforts are not in vain and never will be. Thus, we have hope for both the seed that we have planted in the past, and the seed that we have opportunity to plant today, and tomorrow. So let's roll up our sleeves, get to work, and join in the gospel work that God is doing. We have full assurance that our partnership in the gospel will not be in vain, God will bring it to completion at the day of Christ. Here are two more detailed arguments concerning verse 6. My wife often calls me prolix. It's a word that we learned from watching Downton Abby. It means that I talk a lot. Case in point, today someone asked me a question on Facebook. I typed out my answer, and it was too long to post. So I'm creating a blog post just for that particular answer. Since it's a Facebook comment, you won't find citations, you may find poor grammar or misspellings, but at the end of the day, you'll find my answer. Oh wait. I guess I should give you the question. "What makes you think that Shane Claiborne is not a brother in Christ?" This is going to be hard for me to do because Claiborne hides pretty well. Many years ago, when the emergent church was being developed, men like Rob Bell, Brian McClaren,Tony Campolo, Doug Pagitt, Mark Driscoll (who ended up leaving the movement because it denied the gospel), and many others introduced a new sort of theology into the church at large. This theology had many differing characteristics depending upon who you asked but three points of theology upon which all agreed (except for Driscoll, which is why he left) was 1. "there is no salvation apart from Jesus, 2. God is love, and 3. Jesus had already saved everyone whether they realized it or not." Of course, such theology would be immediately identified as heresy by the church at large, so here's how the deceit works. 3. Don't mention that you believe everyone is already saved, no matter what they believe. (as an analogy, imagine a person who ran a red light and got ticketed. A neighbor paid their fine. You tell them that the neighbor paid their fine and they don't believe you. But just because they don't believe doesn't mean that their fine isn't paid.) This is how these men see the atonement. All Muslims, Buddhists, and Roman Catholics are saved because Jesus paid their fine, even if they don't believe. So at the end of the day, you had a strong group of radical men within the church proclaiming that there is no salvation apart from Jesus, and speaking about loving God and loving neighbor. What a great message right? Salvation in Christ and loving neighbor! Completely in line with the gospel and the word of God. However, it's the silence of point 3 (that all men are already saved) that makes things very difficult. Because, if all men are already saved, then the need to proclaim point 1, expound on point 1, teach point 1, and focus on point 1, is unnecessary. Thus, point 2 becomes the focus. That's why when you listen to these men, you will hear a lot about point 2 (how to love one another), but virtually nothing about point 1. Thus, Jesus is preached, not as savior of sinners, but as the exemplar for how to love and how to treat your neighbor. Shane Claiborne is a part of this group. I'm not saying that he's a part of the Emergent Church (in fact, he doesn't even like the term Emergent Church) but he's a part of this new wave of theology that holds to points 1,2,3 as listed above. The reason that it's difficult for me to prove it to you is because he tries very hard to be silent on point 3. The fact that he is willing to confess Jesus as savior and that he speaks much about how to love neighbor are evident, and make it sound like he's a part of the body of Christ. This is how he hides under the radar. But take quick note of what I said earlier. These men of whom I speak, will all write, speak, and act A LOT concerning point 2, (how to love neighbor) while NEVER preaching repentance in order to be saved. (because they believe everyone is already saved) so the focus of their message will always be about this world, and this life, and how to make this world the best world possible. In other words, let's work to abolish poverty, disease, suffering in this life. After all, if everyone is already saved, then what is the need to speak about the world to come? Does that describe Claiborne? Yes it does. But let's continue. As I said, it's almost impossible to pin these guys down because they don't come out and preach point 3 (that all men are already saved). So since all we hear is a little bit of point one and a lot of point 2, they seem orthodox. After all, who's going to declare them heretics for preaching about loving neighbor? So as I continue, I'm asking you to look closely and see that they will come as close to preaching point 3 as they can without actually saying it directly. This was the case with Rob Bell. He flew under the radar for a long time and no one listened to my warnings about this very thing until he wrote the book "Love Wins" and came out and declared point 3 publicly in no uncertain terms. Of course, once he did, he was rejected by the church at large. 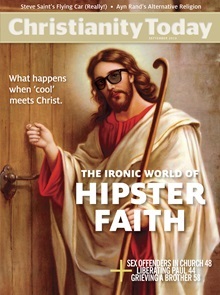 You may or may not remember John Piper tweeting "Farwell Rob Bell" when the book was published. Claiborne continues to fly under the radar but every once in a while his tail fin will poke above the radar line and you can see a tiny bleep on the radar screen. And unless you already know that the Shane Claiborne bomber is in the air, you might think that blip is just a bird, or perhaps a kid flying a kite. Or you might be confused as to what you're seeing and say something like Jay has said, "he seems iffy." You can tell that there is something wrong, but you won't be able to see it clearly. So let's begin looking at a few tail fins that have popped up on the radar screen. "when the curtain of the temple was torn open as Jesus died on the cross. Not only was God redeeming that which was profane but God was setting all that was sacred free. Now God dwelled not behind the veil in the temple but in the eyes of the dying and the poor"
Here, when Claiborne says that he sees God dwelling not inside believers who are dying and poor, but he sees God as dwelling inside EVERYONE who is dying and poor, whether they believe or not. Point 3 has shown a bit on the radar. Not those who were believers and who were dying, but those who were unbeleivers who were dying. (not to mention that even if they were believers this would still be a troubling statement) But suffice it to say that Claiborne sees God dwelling in unbelievers. "one of the barriers seems to be the assumption that we (Christians) have the truth and folks who experience things differently (Muslims) will all go to hell"
Here, Claiborne is affirming that even Muslims will be saved because it's only an "assumption" that Christians have the truth. "You also note in your book the encounter of Francis of Assisi and the Muslim Sultan …they came together across major religious divides and had a mystical unity … Maybe we will even find a mystical union of the Spirit as Francis did." Really? Are we to have "mystical unity" with Muslims? "“Let’s dive into the Scriptures together, correcting distorted understandings of the warrior God by internalizing our allegiance to the slaughtered Lamb"
There are a few problems with the quote above. 1. He claims that God is not a warrior God and was not responsible for the crucifixion. 2. He claims that God is a loving sacrificial God who wold never make war on anyone. 3. He denies that Jesus is returning to make war against the wicked. "The other night I headed into downtown Philly for a stroll with some friends from out of town. We walked down to Penn's Landing along the river, where there are street performers, artists, musicians. We passed a great magician who did some pretty sweet tricks like pour change out of his iPhone, and then there was a preacher. He wasn't quite as captivating as the magician. He stood on a box, yelling into a microphone,... He talked about how we are all going to die and go to hell if we don't know Jesus... All I could do was think to myself, I want to jump up on a box beside him and yell at the top of my lungs, "God is not a monster.'" Here Claiborne shows his hatred for the gospel. He thinks that the God who would send people to hell is a monster. Here Shane appears on the radar screen in two small blips. 1. He recognizes that there are men who "believe in God" but they don't believe that Jesus' grace can "save the whole world" but he doesn't put himself in that category. In other words, he himself is one who thinks that God's grace is big enough to save the whole world. And he encourages anyone who disagrees to pray that God's grace IS going to save the whole world. Shane wrote a series of articles for CT called "The Gates of Hell". Here's how the editor sums up his first article. 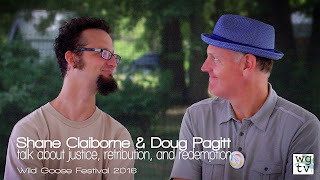 "In part one of his post, Shane Claiborne challenged our assumptions about hell. Is it merely something people experience after death, or is hell a living reality for many on earth?" You see? He's challenging our assumptions about hell. It's not a place for the wicked in the future, it's a place here and now (because everyone is going to heaven). "Just as we are building walls to keep people out of our comfortable, insulated existence, we are trapping ourselves in a hell of isolation, loneliness and fear. We have "gated communities" where rich folks live. We put up picket fences around our suburban homes. We place barbed wire and razer-wire around our buildings and churches. We put bars on our windows in the ghettos of fear. We build up walls to keep immigrants from entering our country. We guard our borders with those walls - Berlin, Jerusalem, Jericho. And the more walls and gates and fences we have, the closer we are to hell. We, like the rich man, find ourselves locked into our gated homes and far from the tears of Lazarus outside, far from the tears of God." Hell for Claiborne is poverty and suffering. "Let us pray that God would give us the strength to storm the gates of hell, and tear down the walls we have created between those whose suffering would disrupt our comfort. May we become familiar with the suffering of the poor outside our gates, know their names, and taste the salt in their tears? then when "the ones God has rescued," the Lazaruses of our world - the baby refugees, the mentally-ill wanderers, and the homeless outcasts - are seated next to God, we can say, "We're with them." Jesus has given them the keys to enter the Kingdom. Maybe they will give us a little boost over the gate." And salvation is salvation from temporal suffering. Jesus died to help us put an end to temporal suffering. Twenty three days from this posting, Shane Claiborne will be meeting with Tony Campolo at Yale University. If anyone disagrees with my opinions given above, I challenge you to watch the live stream of the conversation he has at Yale. Listen for talk about sin, repentance, hell, punishment, and the need for everyone to become a Christian or be cut off from God forever. It's 23 days away. I'm not a prophet, nor am I the son of a prophet but I can tell you this. There will be NO talk about the need for men to come to faith in Christ. There will be NO talk about all other religions being false. There will be no attempt to save men from the wrath to come. How do I know this? Because I know Claiborne and Campolo. They're false teachers. There may be talk about Jesus and how he loves and wants to save. But be careful, because they won't be referring to salvation from sin, they will be referring to salvation from suffering and "evil in this world." One of the greatest ways to detect a false teacher is not to listen to what he says, but to pay close attention to what he does NOT say.